I don’t want to go have snacks. I want to hear more stories! She transforms as she tells a tale, the glow from within lighting her face and illuminating her stories. We all had a great time! The kids were all talking about you yesterday. They loved retelling your stories! I loved the story (Mary Culhane), and even more I loved the emotion in the teller’s voice. 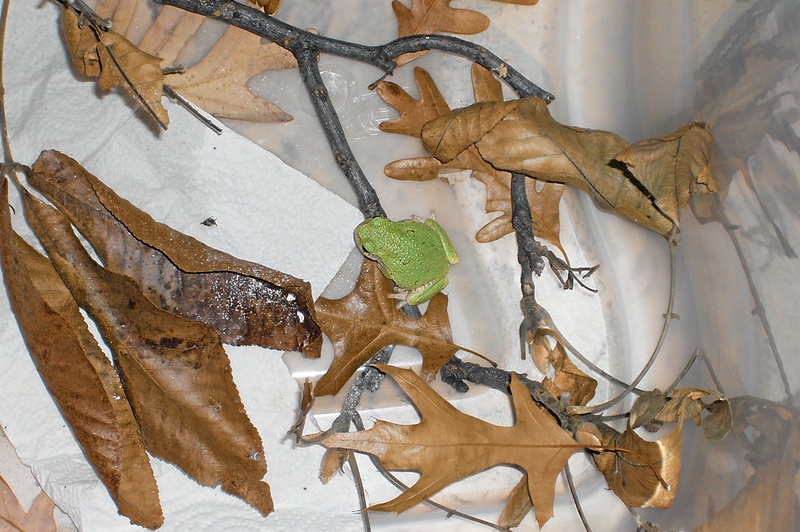 Thank you for telling stories to our campers at Hawn State Park. The stories were entertaining, lively and easy for our campers to relate to. Your stories are always welcome in my coffee house. It’s not the same with you gone. No one tells us stories. Thanks so much for visiting our school today. The stories you shared were wonderful and had great lessons. Thank you for the wonderful storytelling. The stories held the attention of the patients and made their day go much easier. Jim and I had a lovely Thanksgiving with local cousins with a special treat. information with the tales. A good pick for a nature lover aged 6-10. Available through www.storytellermary.com and online CD or MP3 http://www.cdbaby.com/Artist/MaryGarrett. I enjoyed Froggy tales so much, I had to listen to some of it twice. that Prince was doing. I must say you took excellent care of the boy, and he sang his thanks beautifully. His departure brought tears to my eyes, but it really was the right thing to do. So glad you made this CD. It will bring pleasure for years to come. Thank you. 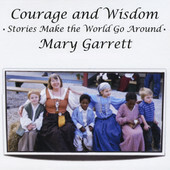 Old folktales from many lands and cultures, told in Mary Garrett’s unique voice come to lie in modern times on Mary’s CD, Courage and Wisdom: Stories Make the World Go Around. Beginning with her father’s wise words and continuing through stories that can be funny and frightening, puzzling and provocative, timeless and yet timely, Mary weaves her stories into a tapestry of rich images and ideas. I met Mary Garrett online, in a new community formed by the Storytell listserve group. I was still finding my way in the confusing and exhilarating world that I had discovered quite by accident. Storytell and its many experienced members guided me in those early years, and Mary Garrett was one of those who shared her wisdom and stories freely with this shy newcomer. Over the years, I have learned much from Mary. 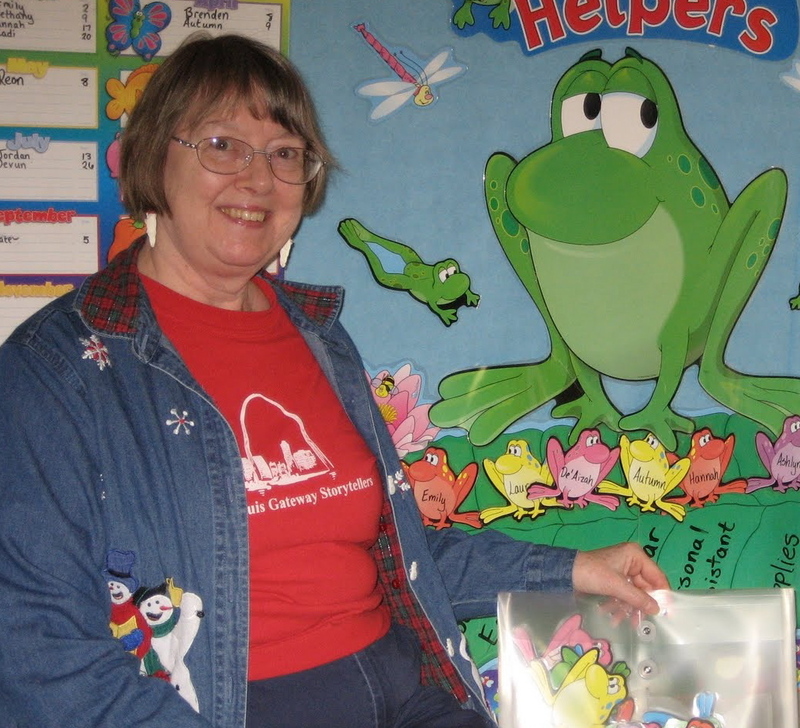 Online, I shared Mary’s joys and frustrations as a teacher in St. Louis, and rejoiced with her when retirement was finally a reality for my friend. Retirement allowed Mary to pursue storytelling in new ways. This CD is one of the new goals Mary set and achieved as she developed her storytelling career into new areas. Making a CD is not so easy as it might seem. The recording itself is the easiest part; selecting stories is the most difficult. What stories? How do the stories relate to each other? How to develop a comfortable flow to the tales that deepens and enriches each story, complementing one with another? How to bring the listener safely and joyfully to the end? It is clear from the beginning that Mary put a good deal of thought in her story selections. She begins with a comfortable, humorous tale from childhood ; from that safe place she leads the listener from one moral dilemma to another, in the process demonstrating that while the stories come from many cultures, their meaning will resonate with listeners of all ages and beliefs. From a simple rabbit tale to the richness of Scheherezade, the suspenseful Mary Culhaine and the wisdom of The Innkeeper’s Wise Daughter, Mary wraps us in brightly colored words like a silken shawl, and travels the world with us on the magic carpet of story in our minds.